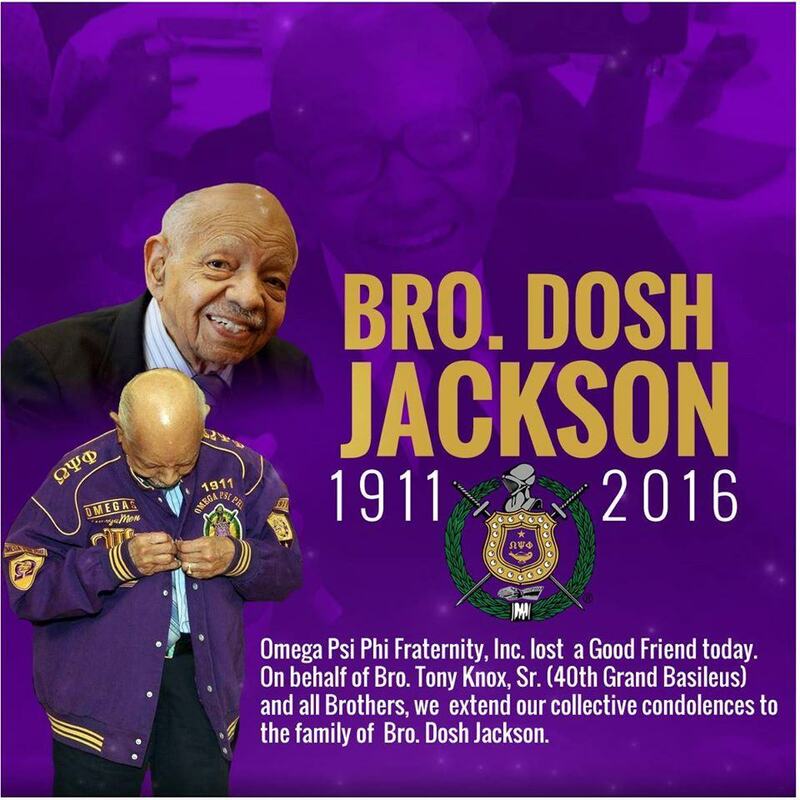 It is with great sadness that we at WatchTheYard.com inform you that Dosh Jackson, the oldest living member of Omega Psi Phi, passed away this last week at the age of 105. Jackson was born in Macon, Georgia, February 22, 1911, the year that Omega Psi Phi was founded. He attended Morris Brown College, worked for the U.S. Postal Service for 35 years, started his own electronics company and was the oldest living member of Omega Psi Phi. Bro. Jackson pledged Omega in 1934 at Psi Chapter at Morehouse because Morris Brown did not at the time have a chapter. Upon crossing into the bond, Bro. Jackson founded the Alpha Sigma Chapter on Morris Brown’s campus. Take a look at Bro. Jackson hopping to “Atomic Dog” on his 100th birthday in Atlanta in 2011. On his 105th birthday, Bro. Dosh Jackson gave the following speech at the First Congregational Church in downtown Atlanta. If you want more information on Bro. Jackson, watch this three-part interview that he did about his life and Omega in 2010. We ask that you keep Bro. Jackson’s family, friends and fraternity brothers in your thoughts. We also ask that you leave your condolences and memories of him in the comment section below so that his family can see how much he meant to all of us.